There was a time in my life when I was interested in trying to answer the question “What is Art?” Although I have long given up trying to find a formula that satisfies me, the nearest I can get is that it is something that sets out to stimulate, visually and intellectually, even if it does not work for me. Over the years I have always made a point of trying to see what is new and what is “in fashion”, even in the notoriously fickle and material world where art is traded like any commodity. So with some skepticism I heard of an exhibition in the Guggenheim by a young German artist (born in London in 1976) called Tino Sehgal. At first I thought he might be Jewish and his name was a tarted up version of “Segal”. But it turns out his father is of Pakistani origin, and I doubt there are any living Jews left in Pakistan. Tino Sehgal constructs situations that defy the traditional context of museum and gallery environments, focusing on the fleeting gestures and social subtleties of lived experience rather than on material objects. Relying exclusively on the human voice, bodily movement, and social interaction, Sehgal’s works nevertheless fulfill all the parameters of a traditional artwork with the exception of its inanimate materiality. They are presented continuously during the operating hours of the museum, they can be bought and sold, and, by virtue of being repeatable, they can persist over time. But that puffery did not put me off so I paid me bucks and went in. On the ground floor of the Rotunda were a young couple dressed casually in jeans, writhing on top of each other in slow motion, rotating, rising and then falling back down, embracing, grinding, and kissing, and occasionally turning to look at the audience. It was supposed to refer to some of the most romantic works of art that have included an embrace. But frankly there was nothing either romantic or appealing about what they were doing. I thought perhaps if I stared back at the artists they might open a conversation with me but they just returned my stare and returned to their writhing. So I started to walk up the ramp to see what else there was. As I reached the first level this cute little girl, perhaps 8 years old, broke away from a group of other kids and walked up to me and looked me in the eyes and asked so innocently, “What is progress?” For a moment I thought it was a joke. That was some heavy question for an eight-year-old to ask. I smiled back at her cute face. Then it hit me that this was part of the exhibition, or happening, or whatever. So I replied by telling her about physical progress, for example from walking, to the wheel, to railways and cars and jets. But there was moral progress, humans behaving better and more sensitively. She listened attentively but said nothing and when I got to the next level she disappeared. As I looked around to see where she had gone, a young man accosted me and asked me where standards of morality come from. I took a second or two to cotton on, then I fell back on my philosophical training and started to enumerate the various theories philosophers had for understanding ethics and I mentioned the religious option too. He seemed interested in arguing, so we argued, quite intensely, until we reached the next level when, once again without any sign or comment, he disappeared. This time I was ready when a middle-aged lady with her arm in a sling asked me out of the blue whether I ever passed homeless people begging on the street. We talked about whether they were homeless out of choice or circumstances and if they wanted money for food, drugs, or some nefarious activity, and whether even if one did not give money one might just give a friendly sympathetic look. Once again the discussion was intense and challenging. And up we went to the next level and she disappeared on cue. An older man took over and he talked about how his part of New York had changed so much over the years, with all kinds of new immigrants and different kinds of places of worship, and he asked me if I had noticed how my area had changed. We talked till we got to the top. Before he could go, I asked him what he did and how he got involved in this. He told me that the participants were either involved with art colleges and galleries or were friends of friends. He was a retired academic and he enjoyed his stint though it was tiring talking and walking up the floors for four or five hours a shift. And off he went, as if summoned by some higher unseen authority, to be recycled as it were. I thought of the angels on Jacob’s ladder going up and coming down. I went back down, watching other couples in deep discussion whom I would not have paid any attention to before, and arrived at the bottom to find the writhing couple still writhing. And out I went into the cold winter air and walked back across Central Park to the West Side, thinking about what had happened. The experience had worked. I was stimulated. I started thinking about the interactions and the issues we discussed and they really had made me think and reconsider some of my views. And I thought that could only be “a good thing”. I had enjoyed the experience and benefited from it. If that was Art, so be it. And if it was not, who cares! I had a positive experience. I was made to think! And I wondered if religion and art might not have something in common after all! I wonder how exactly these "artworks" can be "bought and sold"? It seems the Guggenheim is trying to reinvent the wheel: is this art not more akin to theatre, requiring a cast of characters? These days there are many unconventional forms of theatre based on all-the-world's-a-stage … interacting with the audience in a real-world setting is now well-established. See also "flash mobs" blurring the lines of art and life. Nevertheless, as you say a stimulating experience of whatever sort is a good thing. I'm just curious that you were so impressed by your various interlocutors' debating abilities … I would have imagined them not to be so highly rated by a Hacham such as yourself Jeremy ! Was it perhaps because the whole thing had the element of surprise and your expectations were set quite low? This social interplay from conception to old age sounds interesting and stimulating but is it art? I suppose the question is: must art have form? I agree with Rob – it is more theatre than anything else. What worries me more is how many hours that little girl has to stay there for and even if it is only one or two at a time, will it be good for her? I love modern art and art forms – the Anish Kapoor exhibition at the RA was totally unlike anything I or my grandchildren had ever seen but even the 5 year old was mesmerised by it. All ages could find something in it to appreciate – it was literally wonder full. Perhaps you had to be at the Guggenheim to get the best out of it. Yes, I was impressed because they were articulate and intelligent and able to engage me. Of course they were not of the highest calibre but I didn't go expecting any intellectual engagement and I got more than I bargained for. When compared to the constant flow of banality on the Television and in the media this was refreshing. Was it great? No. But remember with classical art, for tens of paintings that do nothing for me, all the religious paintings just bore me, and what about the stuffy pompous portraits, only the occasional one really engages me emotionally. This was at least stimulating, both visually and mentally. Sure there's so much rubbish masquerading as art, one has to be discriminating and not allow oneself to be taken for ride (apart from the crude money game that so much of "art" is nowadays). There was a whole gang of some twenty kids there so I'm pretty confident they were well taken care of and not exploited or press ganged! Besides one circuit takes a few moments at most. Now is it art? What is art indeed? And isnt theatre art too? Isnt photography art? This doesnt mean everything is as good or as significant as evereything else of course. And why are we so concerned with definitions and categories. Can't one just open oneself to different experiences some of which will be interesting, others boring? 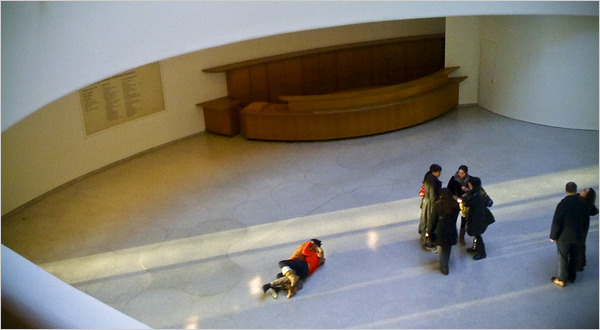 At the MOMA theres another exhibition featuring a controversial "event artist" which includes nudes and other real life performers and films of the artist lacerating herself of Marina Abramovitz. In the entrance she sits all day staring straight ahead and not moving (apparently she has a piss pot under her voluminous skirts). The public lines up to take turns staring back at her. Does nothing for me. But I will not say it might not impact on others. At least it makes you think. Too few humans think or experience outside of their patterns and comfort zones. Art, like religion, should try to shake them out of their comfort zones. I hear what you're saying, Jeremy and well remember having an argument with a famous lecturer on art as to why a wonderfully made piece of furniture was not a work of art but a piece of craft. I'm afraid I lost the plot with him over the matter because to me it was a piece of art. Luckily we didn't come to blows. Maybe art should shake you up and make you think but shouldn't it also beautify and enrich your life in some way? But then I suppose, even the ugly has a beauty…..
How interesting, that these topics have been made into pictures at an exhibition. Art and beauty are indeed very subjective, often contradictory, and the objects of hype and market manipulation. I require two elements, intent on the part of the creator and intellectual or visual stimulus on the part of the audience. Wait till I write about Marina Abramovic at MOMA!